For submitting manuscript visit new version of portal here https://ejournal2.litbang.kemkes.go.id. Buletin Penelitian Sistem Kesehatan has been indexed by Indonesian Scientific Journal Database; Indonesian Publication Index; Bielefeld Academic Search Engine; Directory of Open Access Journals;Open Academic Journals Index. Aspirator Journal (Journal of Vector-borne Diseases Studies) is one of the journals published by Badan Penelitian dan Pengembangan Kesehatan (National Institute of Health Research and Development), Ministry of Health of the Republic of Indonesia. Aspirator journal has been acredited by Lembaga Ilmu Pengetahuan Indonesia (Indonesian Institute of Science) by Decree No. 782/AU1/P2MI-LIPI/11/2017. Aspirator is published since 2009 and has been focused in disseminating research results, objectives, analysis and review related to vector borne disease. During 2016, Aspirator has published 12 research. Media Gizi Mikro Indonesia (Indonesian Journal of Micronutrient) is a scientific journal published periodically by the Center for Research and Development of Iodine Deficiency Disorders (BPP GAKI), regularly twice a year. A paper published in the form of text / article the results of research and development, the results of scientific analysis of secondary data, a summary of the current topics in the field of Micronutrients. Editor receives manuscripts / articles, both from researchers at BPP GAKI and outside. The journal has been accredited Indonesian Institute of Sciences (LIPI). Media Gizi Mikro Indonesia has been indexed by Indonesian Scientific Journal Database; Indonesian Publication Index; Bielefeld Academic Search Engine; Open Academic Journals Index; Google Scholar. Jurnal Ekologi Kesehatan has been indexed by Crossref; Directory of Open Access Journals (DOAJ) Indonesian Scientific Journal Database; Indonesian Publication Index; Bielefeld Academic Search Engine; OAJI. Firstly published in December 2010, Jurnal Kesehatan Reproduksi (Journal of Reproductive Health) is an authoritative source of scientific information and knowledge based on research and analysis focused on sexual and reproductive health related topics. All papers are peer-reviewed by at least two referees. Jurnal Kesehatan Reproduksi (Journal of Reproductive Health) is issued 2 times a year and has been accredited by Lembaga Ilmu Pengetahuan Indonesia (Indonesian Institute of Sciences) by No. 763/AU1/P2MI-LIPI/10/2016. Jurnal Kefarmasian Indonesia is a scientific journal published by the Center for Research and Development of Biomedical and Basic Health Technology, Board of Health Research and Development, Ministry of Health of the Republic of Indonesia. The journal publishes original research articles in pharmaceutical science such as Pharmaceutical Technology, Pharmacology, Pharmaceutical Chemistry, Traditional Medicines and Pharmaceutical Care. The journal was established in 2009 while online publication has been started from 2015. The journal is published in Bahasa Indonesia and English. Jurnal Kefarmasian Indonesia is a biannual, open access, peer-reviewed and online pharmacy journal. Jurnal Kefarmasian Indonesia aims to serve the updated scientific knowledge for processing manuscript as well as for processing manuscript. The journal has been acredited by Indonesian Institute of Science by Decree No. 783/AU1/P2MI-LIPI/11/2017. Jurnal Kefarmasian Indonesia has been indexed by DOAJ; Indonesian Scientific Journal Database, Indonesian Publication Index, Bielefeld Academic Search Engine, Open Academic Journal Index; Google Scholar; Portal Garuda. Vektora : Jurnal Vektor dan Reservoir Penyakit is a scientific journal published by Balai Besar Penelitian dan Pengembangan Vektor dan Reservoir Penyakit (B2P2VRP) Salatiga, Badan Penelitian dan Pengembangan Kesehatan, Ministry of Health of the Republic of Indonesia. The journal publishes original research articles in the field of disease control derived vectors and reservoirs of disease which include epidemiology , biostatistics , administration and health policy ,environmental health , health promotion and behavioral sciences . Articles can be submitted research articles , article research paper , and policy papers . The journal was established in 2009 while online publication has been started from 2015. The journal is published in Bahasa Indonesia and English. Vektora : Jurnal Vektor dan Reservoir Penyakit is biannual, open access, peer-reviewed, and online vector-zoonosis journal. Vektora : Jurnal Vektor dan Reservoir Penyakit aims to serve the updated scientific knowledge for researchers in vector and zoonosis. There is no charge for submitted manuscript as well as for processing manuscript. The journal has been registered with e-ISSN 2354-8789, p-ISSN 2354-868X and accredited by Indonesian Institute of Sciences (LIPI) with Decree No. 784/AU1/P2MI-LIPI/11/2017 and accredited by Ministry of Research, Technology, and Higher Education with Decree No.21/E/KPT/2018. Jurnal Biotek Medisiana Indonesia (The Indonesian Journal of Biotechnology Medicine)) is the journals published by Pusat Biomedis dan Teknologi Dasar Kesehatan (Center of Basic Biomedical and Technology of Health), Ministry of Health of the Republic of Indonesia. Jurnal Biotek Medisiana Indonesia (The Indonesian Journal of Biotechnology Medicine) published 2 times a year. Journal which is first published in 2012 is a forum for communication of research results, review the results of research,methodologies and new approaches in research related to health efforts in Indonesia. SPIRAKEL has been indexed by Indonesian Scientific Journal Database; Indonesian Publication Index; Bielefeld Academic Search Engine; OAJI; Google Scholar. See SPIRAKEL profile in Google Scholar by clicking here. Jurnal Vektor Penyakit is an open access, peer-reviewed, online journal fully dedicated to publishing a quality manuscript on all aspects of tropical diseases, i.e malaria, dengue, lymphatic filariasis, chikungunya, schistosomiasis, soil-transmitted helminth, leptospirosis and others related to vector, reservoir, and zoonotic diseases. Balai Penelitian dan Pengembangan Pengendalian Penyakit Bersumber Binatang Donggala has published Jurnal Vektor Penyakit since 2007. It is published twice in a year (June and December). See Google Scholar Profile for Vektor Penyakit Journal by clicking here. 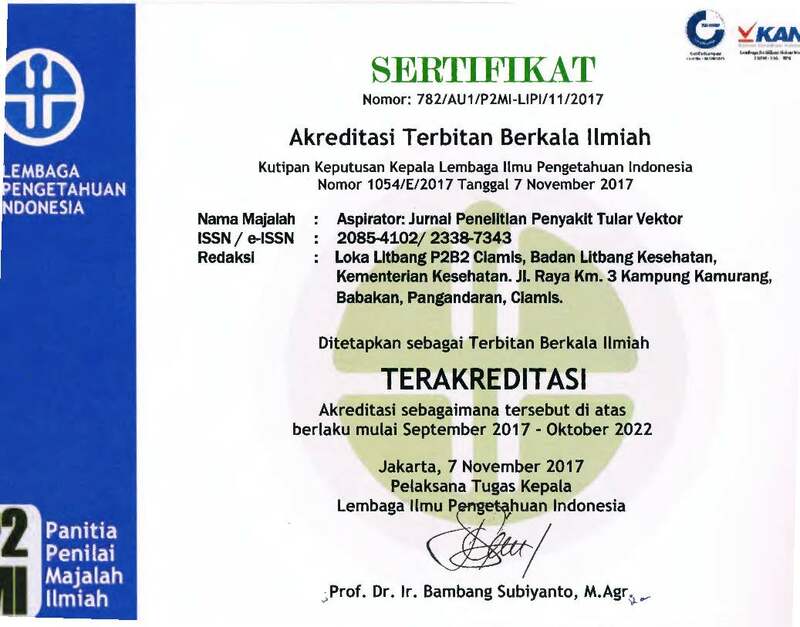 Jurnal Vektor Penyakit has been accredited by Indonesian Institute of Sciences (LIPI) number: 791/Akred/P2MI-LIPI/01/2017 since October 2017. Valid thru: October 2022. Jurnal Vektor Penyakit has been also accredited by Indonesian Ministry of Research, Technology and Higher Education (RISTEKDIKTI) number: 51/E/KPT/2017 since 04 December 2017. Valid thru: December 2022. Jurnal Penyakit Bersumber Binatang (The Journal of Zoonosis) is media of information media Research and Development or Animal Sourced Disease focusing in research or study about malaria, filariasis, dengue fever, anthrax and rabies. The journal is published by the National Institute of Research and Development (Loka Litbang Penelitian Penyakit Bersumber Binatang, Waikabubak) published regularly 2 times a year. Jurnal Penyakit Bersumber Binatang (The Journal of Zoonosis) has been indexed in: Public Knowledge Project; Open Journal System Badan Litbangkes; Google Scholar; and BASE (Bielefeld Academic Search Engine); Indonesian Publication Index; Open Academic Journals Index. Jurnal Penyakit Bersumber Binatang (The Journal of Zoonosis) is being reviewed by Universal of Impact Factor. See Jurnal Penyakit Bersumber Binatang profile in Google Scholar by clicking here. Journal of Plasma is a media dissemination of scientific research in the fields of health, published two times a year. Plasma journal is a forum for information and communication of research results and reviews literature pertaining to health efforts in Indonesia. Journal of Plasma has already been indexed by Google Scholar. Journal of Health Epidemiology and Communicable Diseases (JHECDs) is a scientific journal managed by Tanah Bumbu National Agency on Zoonosis Control Research and Development (Balai Litbang P2B2 Tanah Bumbu). Our focus is to publish high-quality peer reviewed articles within the scope of epidemiology and communicable diseases mainly related to zoonosis. Published 2 times a year (June and December). “Jurnal Penelitian dan Pengembangan Pelayanan Kesehatan (Jounal of Health Service Research and Deveplopment)” is one of the journals published by Pusat Penelitian dan Pengembangan Pelayanan Kesehatan (Center for Health Resources and Service Research and Development), Ministry of Health of the Republic of Indonesia. Jurnal Penelitian dan Pengembangan Pelayanan Kesehatan (Jounal of Health Service Research and Deveplopment) published 2 times a year. See Google Scholar Profile for Jurnal Penelitian dan Pengembangan Pelayanan Kesehatan (Jounal of Health Service Research and Deveplopment) by clicking here. Jurnal Buski is a scientific journal that publishes research articles, short communications, and review (review) about the epidemiology of health and disease animal sourced. Published 2 times a year (June and December) by the Center for Research P2B2 Tanah Bumbu, South Kalimantan. Jurnal Buski has been indexed by Indonesian Scientific Journal Database; Indonesian Publication Index; Bielefeld Academic Search Engine; OAJI; Google Scholar. See Jurnal Buski profile in Google Scholar by clicking here.